The DC13 model has a 13" wide double cutaway body which is chambered to reduce weight and add resonance. It has hand carved "drop top" construction, with easy access up to the 24th fret. The top and body woods can be selected for tonal as well as visual characteristics. 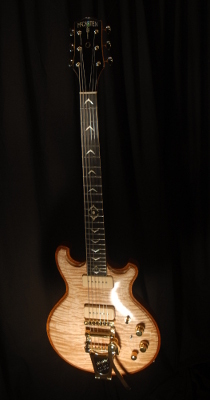 This example has a Curly Maple top, Mahogany body and neck. The fingerboard and heatplate are ebony, inlayed with Gold Mother of Pearl. The hardware is all Gold plated and includes a Bigsby B7 vibrato. Electronics consist of two hand wound P-90 style pickups complimented by a Piezo bridge pickup for a more acoustic like sound. The fingerboard is ebony with Mother of pearl position markers. The head's front and back plates are layered Cherry and maple. The hardware is all Gold plated. Electronics consist of two hum cancelling P-90 style pickups complimented by a Piezo bridge pickup for a more acoustic like sound.